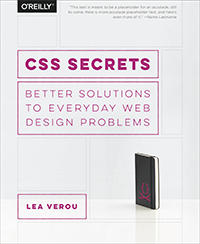 You’re probably familiar with CSS3 gradients by now, including the closer to the standard Mozilla syntax and the ugly verbose Webkit one. I assume you know how to add multiple color stops, make your gradients angled or create radial gradients. What you might not be aware of, is that CSS3 gradients can be used to create many kinds of commonly needed patterns, including checkered patterns, stripes and more. If multiple color-stops have the same position, they produce an infinitesimal transition from the one specified first in the rule to the one specified last. In effect, the color suddenly changes at that position rather than smoothly transitioning. Why transparent instead of the actual colors we want? For flexibility. background-color serves two purposes here: Setting the color of half the stripes and serving as a fallback for browsers that don’t support gradients. To create the picnic-style pattern, you just overlay horizontal stripes on vertical stripes. The hardest one to figure out was the checkered pattern. It consists of two 45° linear gradients and two -45° linear gradients, each containing ¼ of the dark squares. I still haven’t managed to think of a way to create a regular checkerboard (not at 45°) without needing an unacceptably large number of gradients. It will be very easily possible if conical gradients start being supported (currently they’re not even in the spec yet). There are far more pattern designs possible with CSS3 gradients than I originally thought. For more details, see this later post. This entry was posted in Original, Tips and tagged background-size, CSS3, css3 gradients, CSS3 values, multiple backgrounds, patterns. Bookmark the permalink.